When we began researching the American Guinea Hog, we realized that we had unknowingly owned a pair of the these pigs in the mid 90's. We had bought them at Collinsville trade day as potbellies. They were very sweet and friendly pigs, but got bigger than we expected. We sold them after buying a pair of registered potbellies. If we had only known then. These play a part in feeding the family. 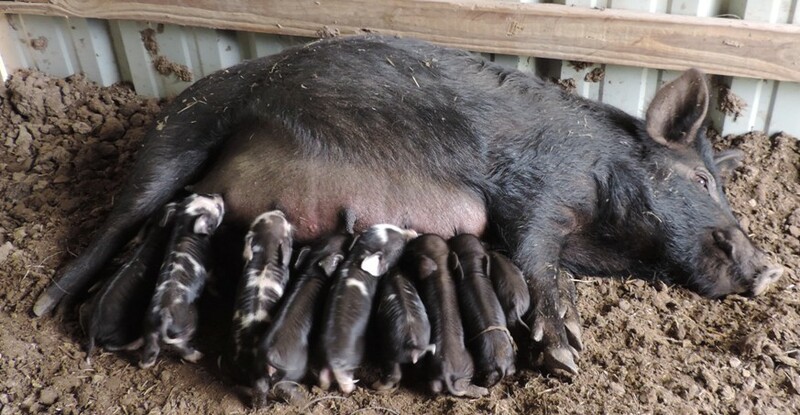 One or two barrow are destined for the freezer each year, and any remaining piglets are sold to other small homesteaders to help this wonderful little breed. 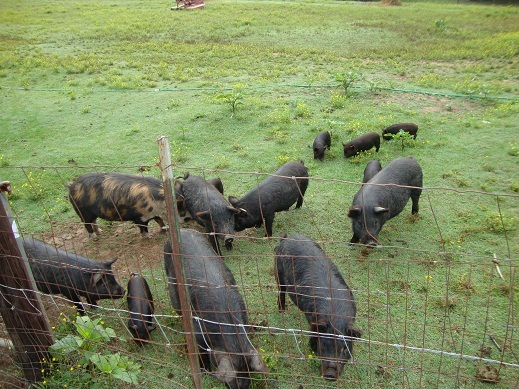 The Guinea Hogs will be registered with the AGHA. 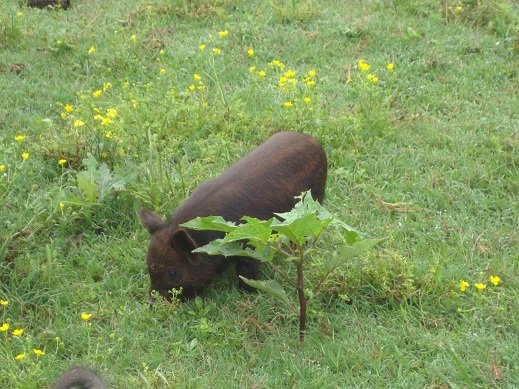 For more information on them please visit ALBC: Guinea Hog or AGHA . 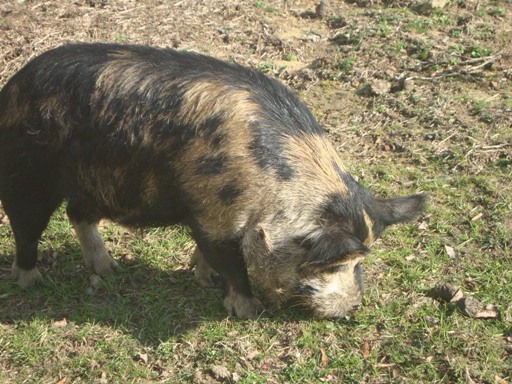 We are very fortunate to have been able to purchase Hamby, our KuneKune boar. 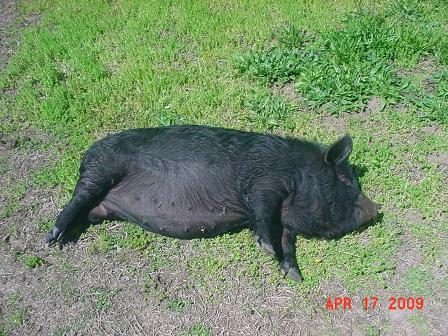 He is being used in a crossbreeding program with the Guinea Hogs. These crosses are small docile animals that can graze and forage extremely well. They require little to no feed if sufficient pasture and forage is available. We processed our first cross barrows in the summer of 2012. The meat is red like beef and has great flavor. 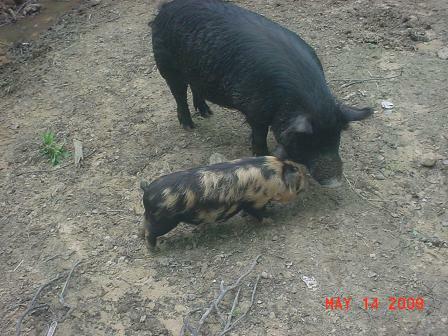 We are expecting two pure kunekune litters and two crossed litters in spring of 2016. 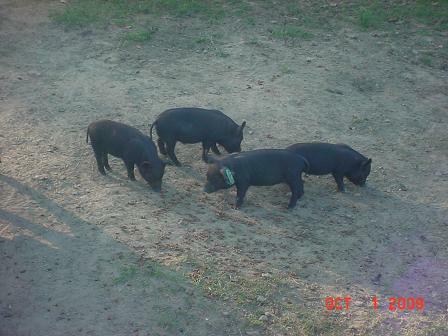 Please let us know if you would be interested in these piglets. We sold all of our pigs during the drought of 2016. 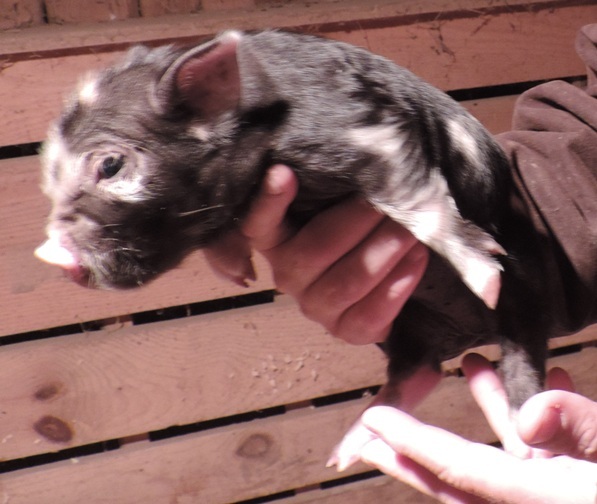 See sales page for piglets currently available. 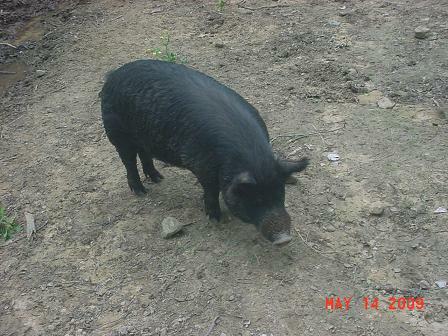 Clancy, below, is a 3/4 KuneKune x 1/4 American Guinea Hog that we purchased in the fall of 2011. 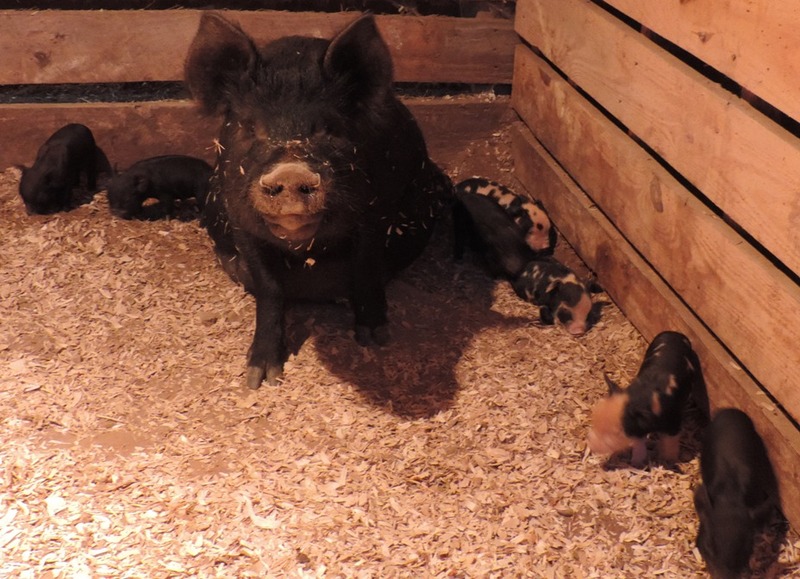 He has made a nice boar for us and is siring some very colorful piglets. "Barbie" is a sweet little girl from Mahsrow Farms in Kentucky. She loves a belly scratch and will walk up and lay down in front of you to get one. We are very fortunate to have been able to purchase "Hamby". 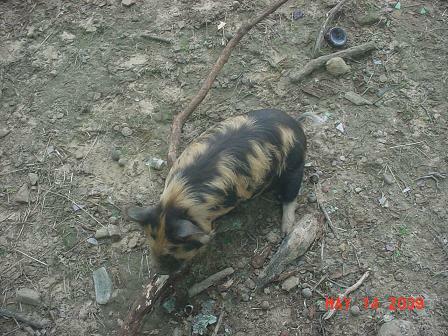 He is a KuneKune boar. 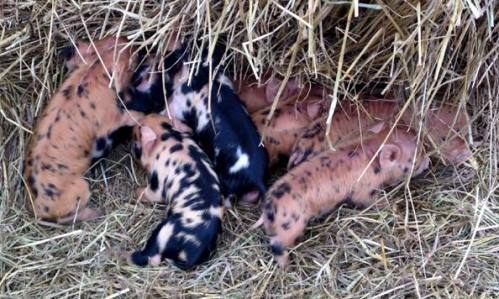 The red and black spotted piglet below. A few pictures of the boys Hamby and Munch. This is Munch. We bought him from a farm in Ga. Barbie came into to heat the day after we brought him home. 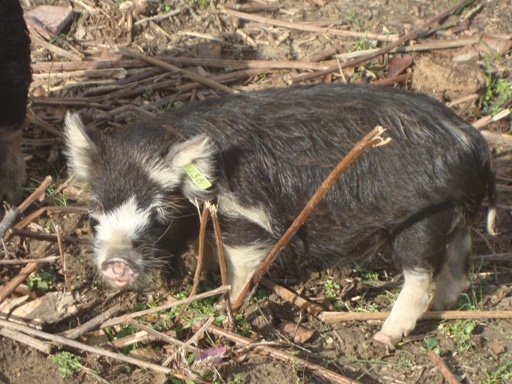 We should have our first piglets by the end of August. Please let us know if you would like to be notified when they arrive. 9/26/09 update, Munch has been sold to a farm in FL. Hamby will breed the girls after they farrow again. 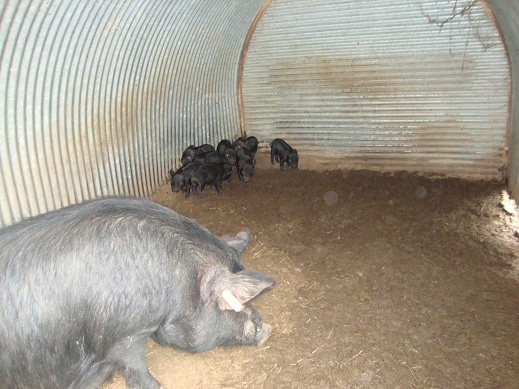 A boar from each sow will be kept as breeding stock. 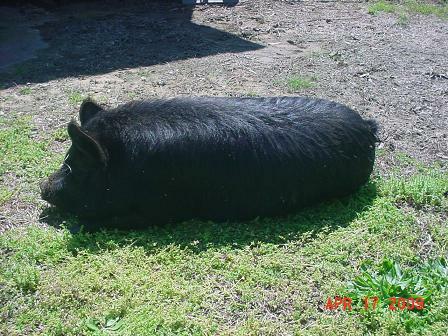 I would like to build a market for feeder pigs. I think this is the only sustainable market and believe it will be a vital part of their recovery. 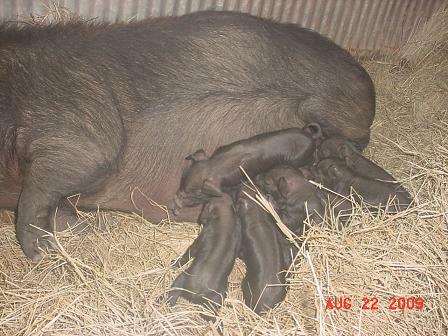 8/21/2009 Barbie delivered 9 healthy little piglets, 2 gilts and 7 boars. Barbie is a very good mother. She doesn't mind us being around or handling the piglets either. This is one of the best thing about these little pigs in my opinion. 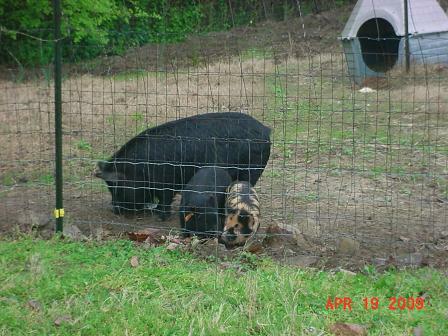 We are planning to keep one gilt and two boars. All the others will be for sale. 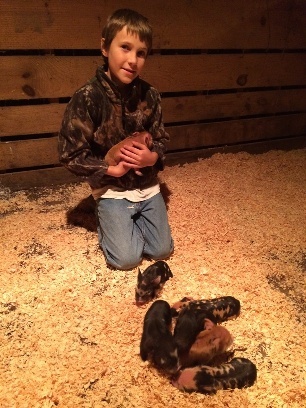 All Barbie's piglets have been sold except for the few we plan to keep. 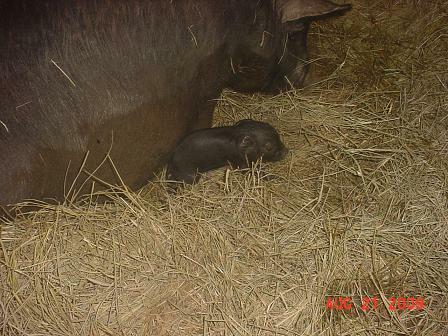 On 4/20/2010 Barbie delivered our first litter of KuneKune x American Guinea Hog piglets. She had 4 gilts and 2 boars. 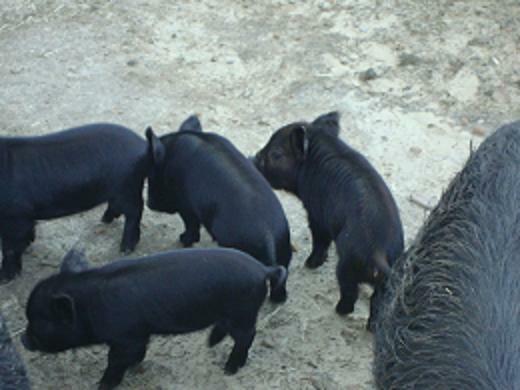 Two of the gilts have slight red highlights and stripes. These all have very short snouts and are doing really well. We will raise on barrow for the freezer. I am interested to see how he does compared to the pure AGH from the previous litter. 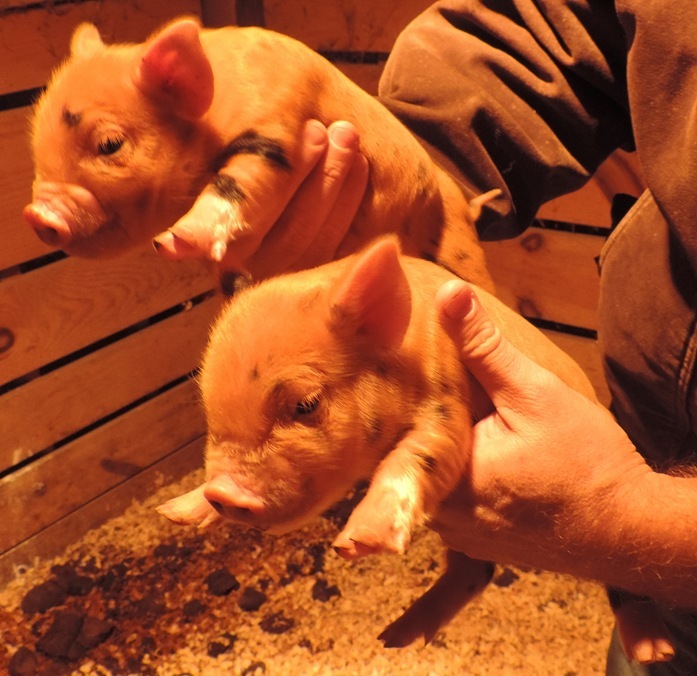 Two of the gilts from Barbie's litter have red stripes. The one that we will be keeping is pictured to the left. 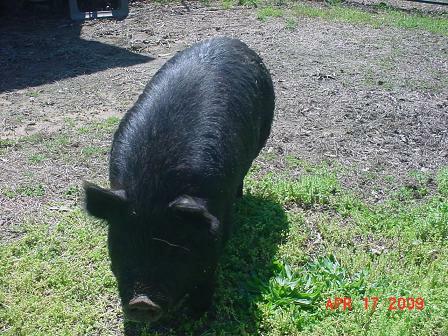 We will breed her to Hamby next year and hopefully get more colored little pigs. Most of the herd is pictured to the right. Hamby is the red and black one. 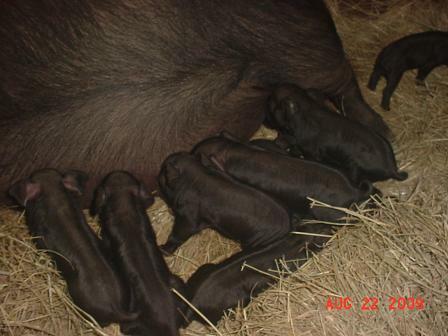 On 5/30/2010 Beatrice delivered 8 little KuneKune X American Guinea Hog piglets. They are all doing very well. None of her litter had the stripping, but they do have a slight reddish tint to them. She had 3 boars and 5 gilts. 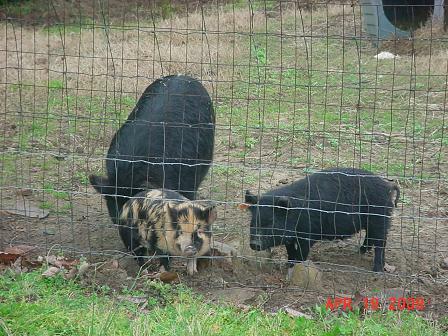 As these pigs are getting older, some of them that were solid black are getting the red stripes.